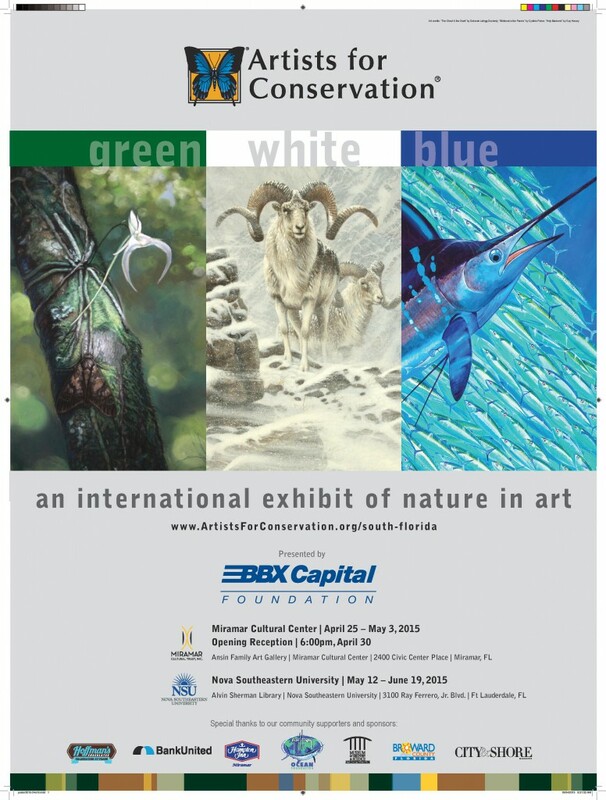 Both nature lovers and art aficionados are in for a treat now through June 19th as the 2015 “Green, White & Blue” exhibit, presented by BBX Capital Foundation, goes on display in two local venues. The exhibit offers an opportunity to view pieces from many of the world’s most recognized and accomplished nature artists, including renowned marine scientist and conservationist Guy Harvey. The exhibit features approximately one-quarter of the Artists for Conservation Foundation’s annual juried exhibit, which opened in September 2014 in Vancouver, Canada. The 45 pieces of art on display, each created by a different artist, depict wildlife and habitats throughout the world. A wide variety of media is represented, from acrylic and oil paintings to sculptures, woodblock prints, colored pencil and even documentary films. The purpose of the exhibit is to link world-class art and artists with wildlife and nature causes in an effort to inspire the public to become engaged and better informed, says foundation creator Jeff Whiting, who spoke Wednesday at a preview reception at the Museum of Discovery of Science in Fort Lauderdale. The foundation, representing 500 nature and wildlife artists worldwide, is also intended to encourage youth to commit to conservation issues by serving as an educational tool for students. “Art and environmental education are areas in school that are receiving less and less time in the curriculum, and we feel that’s a disservice to our future generations,” Whiting says. He says he realized the foundation’s potential as an educational tool after its first exhibit in 2008. The “Green, White & Blue” exhibit, co-sponsored by City & Shore Magazine, can be seen during regular hours through June 19 at the Alvin Sherman Library at Nova Southeastern University in Davie. Admission is free. All artwork in the exhibit is available for sale, and 40 percent of the proceeds of each piece will support a conservation cause of the artist’s choice. For more information, visit artistsforconservation.org/south-florida.